Hat Fitz and Cara can in no way be mistaken for a dainty duo. They are festival favourites throughout Canada, America, Australia, Europe, and the UK and it has been said they pack more energy into one song than most have in an entire career. 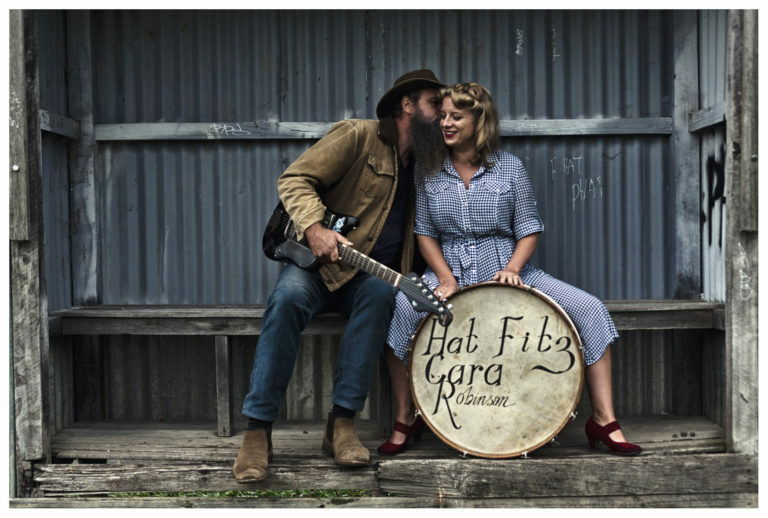 A unique combination of hill-style Gospel blues with old timey flavourings and stripped down to just voices, guitar and vintage drums, Hat Fitz & Cara embellish impeccable rootsy originals with soulful vocals reminiscent of a time once forgotten. Launching their fourth album, ‘After The Rain’ is a unique vintage sound that these two have created themselves yet it is packed with a modern punch that cannot be denied once seen live. This was recorded by the Govinda Doyle who was behind the No. 1 Big Jet Plane by Angus & Julia Stone. Mastered by Graham Durham Exchange Studios who has worked with the likes of Grace Jones, Sea Sick Steve, Groove Armada and many more. Hat Fitz & Cara also make the semi finals from 10,000 down to under a thousand for their song ‘Running Man’ in the International Song Competition.